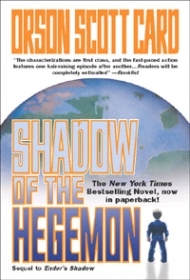 Chronologically, Shadow of the Hegemon is a direct sequel to both Ender’s Game (reviewed here) and Ender’s Shadow (reviewed here). Technically, however, it is more of a sequel to the latter. The author not only assumes you’ve read Ender’s Shadow, but also that you remember all the nitty-gritty details of that book. So if it is some time since you’ve read Ender’s Shadow, you might as well wish to re-read it before reading this book. The Bugger (er, sorry, Formics) Wars are over, and as Peter Wiggin has clearly predicted, the world is falling into a war as nations try to restore their old power (and then some). And the most brilliant military commanders on Earth are the Battle School graduates in general, and Ender’s team in particular. Thus the first moves of war are attempts to kidnap and control those kids. This is the basic premise behind the book; it is also the first, main, and most unacceptable mistake in the entire plot, which renders the whole book almost comic. No matter how much you try to suspend your disbelief, those kids are just that -- kids. Intelligent as she might be, how effective will an 11-years-old girl be when trying to command an army -- not because she wants to, but because she is forced to, at gunpoint? Brilliant as he might be, how realistic is the image of an 11-years-old boy commanding a platoon of adults? In Ender’s Game and Shadow, we were supposed to assume that special training, from a very early age, made the Battle School kids unique. Since the war they were about to engage in was nothing like any war humankind had fought before, and since they were never really required to be present in the field of war, this might have been partly acceptable. But here we are talking about bad old land war (and in Asia, to boot). Even if they were given ample education about classic warfare, how effective could those children be as strategists? And why would veteran high-ranking officers gladly accept those kids -- let alone the ones from hostile nations -- as their superiors? Then there is the question of the villain. Unsurprisingly, Achilles breaks out of the mental institution were he was hospitalized. In practically no time at all, he manages to manipulate world super-powers into doing his will, using empires and their leaders as chess pawns. He is not only as intelligent as the next Battle School graduate, but also fluent, well-educated (in classics as well as modern issues), and so on. And we are supposed to believe this? Recall that Achilles grew on the streets of Rotterdam, and he is not the super-human Bean is. He grew up in a daily war for food, where “school” or “education” were alien notions. Where exactly did he pick up all his knowledge? In his two weeks or so at Battle School? In short, the book requires a wee bit too much suspension of disbelief to be acceptable or enjoyable. The children are presented as no less than minor Gods, in their own view and in the view of their surroundings. War and strategies seem too much like a game of Risk. Ancient enemies, which hate each other on a religious basis (the most difficult kind of enmity to overcome), sign peace treaties after 10 minutes of negotiations led by a brilliant child. And so on. In this book, probably more than in any other book, Card proves to be a master of the technicalities of writings. The text is flowing, the descriptions enjoyable, the characters well-presented, and so on -- but the plot itself is lacking so badly that this time, the technicalities are simply unable to compensate. The book lacks this little extra that turns books into page-turners. With Ender’s Shadow, even though I knew in advance how the plot would end (since it is, after all, the same plot as in Ender’s Game), I still found myself unable to put the book aside. With Shadow of the Hegemon, this was hardly the case. Even more so than Ender’s Shadow, Shadow of the Hegemon is presented as a clearly unfinished story, and the next sequel (or sequels) is simply a matter of time. The sequel to Shadow of the Hegemon, called Shadow Puppets, was published in 2002. It was followed by Shadow of the Giant in 2005. I have no plans to purchase a copy of either. The idea of kids being ''military minds'' made sense in the first book, where the notion was to create strategic planners and fighters that are not encumbered by the history of surface/land wars, and grew up to the notion of war in 3D space (this in fact was the core of the original short story, Ender's Game). It makes zero sense to use these kids as strategic geniuses for land war all of a sudden. Achilles DID go to school. Around the time that Bean was sent to battle school, Sister Carlotta also sent Achilles to a private school. The review is based off of ignorance and a bias against children. Just because you cannot imagine having an extremely intelligent and capable leader who happens to be young doesn't mean that someone else will be unable to recognize the children's talents and utilize them successfully. Particularly if that someone else is a leader that is desperate for power. And they have even a slight trace of intelligence. You made the comment that the kids were supposed to be unique because of Battle School training. That is a half-truth; the kids were special from the beginning, a group of the most intelligent children that could be found on Earth. It was Battle School that refined that uniqueness into something useful. You also said that the war they engaged in was unlike any war that humankind had fought before. Let's disregard the fact that Ender's Game and Shadow covered the 3rd of such a war and get to the meat of the argument. For whatever reason I am expected to think, as you do, that this being the first such war has a bearing on whether or not I can accept that the children win it. You go on to ask whether these children could be effective strategists. It is at this point in the review that I begin to question whether or not you even read Ender's Game or Ender's Shadow, because both of the books glaringly imply a resounding, absolute ''Yes, they can.'' They were already expert strategists by the time Ender's Game drew to a close. Finally, your arguments against an educated Achilles show more of your ignorance of the events in Ender's Shadow. Recall that Achilles was sent to school for nearly a year before being sent to Battle School. Being as intelligent as most Battle School soldiers and certainly more passionate than any of them, even a few weeks at a school would have given him all the education he presented in Shadow of the Hegemon. Your opinions and your ignorance get in the way of the review. As to your reply to tp; ludicrous. A tactician trained in space maneuvers that has to worry about beating enemies that can attack from every angle and keeps track of his troops in a 3-dimensional rather than a 2-dimensional space would find land war extremely easy. But your reply reveals a fundamental flaw in your logic; you think that tacticians are only as useful as their knowledge or experience. Again, this is only a half-truth. A good tactician has the potential to be a good tactician no matter what the setting is. Tactics and strategies are more a mindset than a knowledge bank. The only knowledge a good tactician needs is knowledge of his own troops and their capabilities. It helps, but is not necessary, to know your enemies as well. In Shadow of the Hegemon the children are given this information, which is more than enough to win for a brilliant and creative mind. What idiocy is in this review as to disrespect the intellectusl capacity of children? Children have equal if not more ability to show intelligence and strategy than adults. Because of adolescent innosence children have more open minds, and therefor are able to be smarter. Do not ''hate'' on the book because the children are smarter than you are. Oh, I do not ''hate'' the book -- hate is a strong emotion, too strong to waste on meaningless books. I just find the book bad, that's all. Ha ha, you just got destroyed by Jason and your only comeback is that the book is bad. Seriously? On the point of the ''lack of experience,'' I'd say that Peter Wiggin is the young-in completely in over his head.